I haven’t had time to show off the goodies I got from my HHHH swap pal… until now. She spoiled me very well and I love everything and can’t way to play… er… try everything. First things first … there was chocolate (Ghirardelli Milk Chocolate & Lindt Truffles) … which disappeared very quickly for some reason … so there are no photos of that. 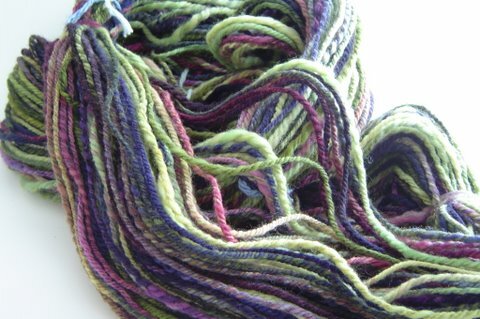 5.5 ounces of lovely punta/corridale handspun yarn. 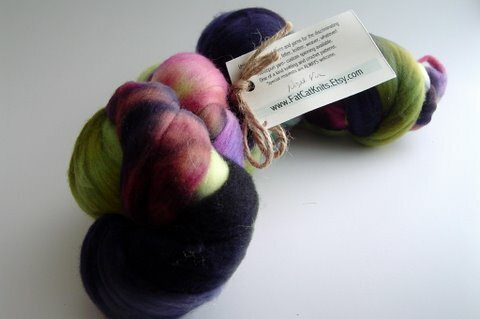 I finally finished spinning for my HHHH swap pal and the fiber is now on its way. 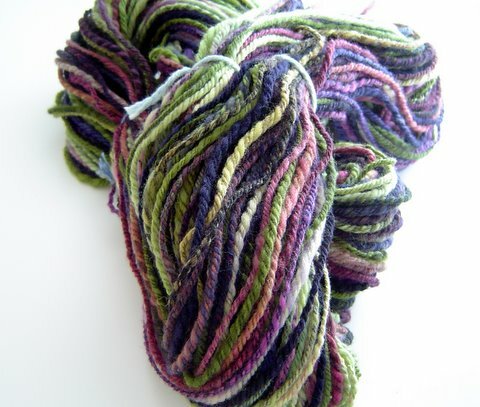 173.33+ yards of chain-plied handspun yarn. 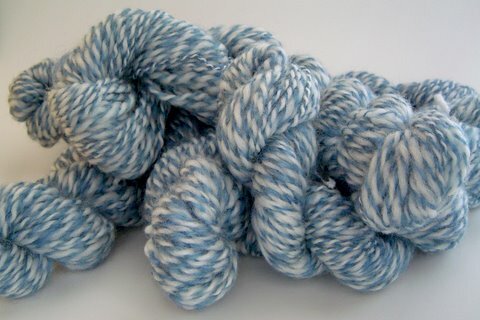 I didn’t get a WPI, but it seemed to mostly range from sport to worsted. 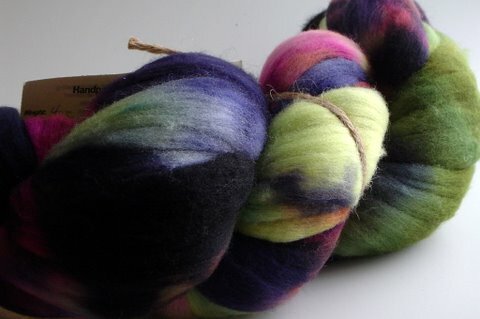 Ironically, this is the most yardage I’ve gotten so far in my spinning. 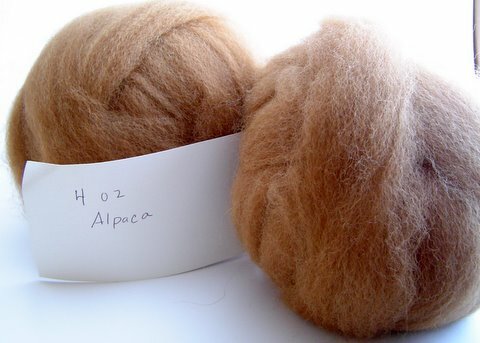 That would have been the only reason I’d have wanted to keep this fiber. The colors really weren’t my favorites and I’m glad it’s going to someone I hope will enjoy the colors more than I would. Here’s more photos for you to enjoy! My spinning. That’s the bad news for me these days. I’m spinning everyday but it sometimes it seems like I’m never going to finish my HHHH project. I am spinning everyday but it doesn’t seem like I will ever reach the end. I am plying and very pleased with the result. 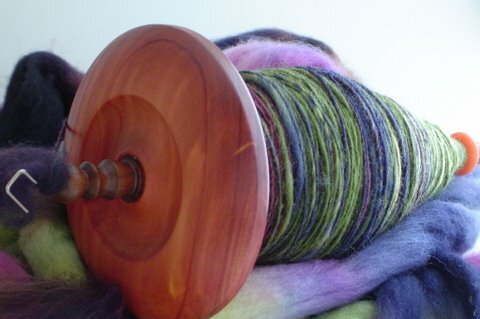 But I am regretting using my new spindle for this project. I feel like it makes spinning harder than it should be. It wobbles… a lot, even with no or not much fiber on it. 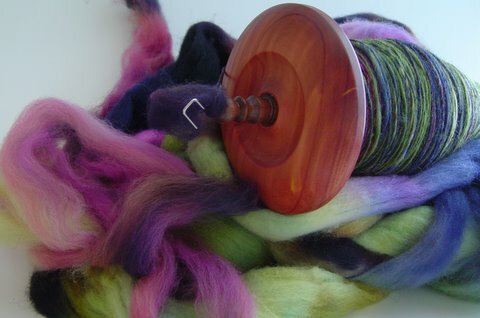 So much more than my spindle made with a toy wheel. I feel like such a slacker. My poor swap pal has had to wait. It’s all so frustrating and if I were spinning this for myself, I would have stopped long ago… but it’s not. It’s for someone else and I don’t wish to disappoint anyone. 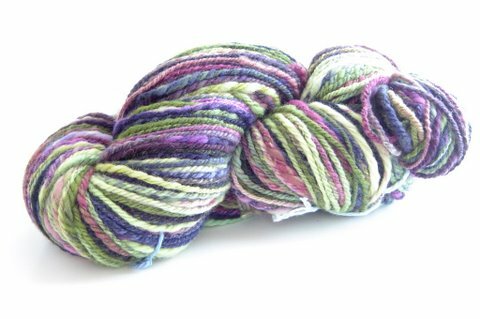 I WILL finish spinning and the resulting yarn will be pretty (I can already tell that it will be) and I sincerely hope that my pal will think it’s worth the wait. My knitting is so wonderful these days. I’m loving it again. I’m reworking a pattern and I’m having fun with it! I’m pretty much ‘redesigning’ on the fly. These are for my grandmother. She wanted some red fingerless mittens. 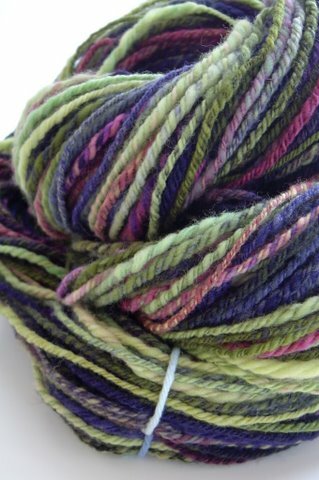 I hope she’ll like the ‘Ruby River’ Dream In Color Smooshy that I got. 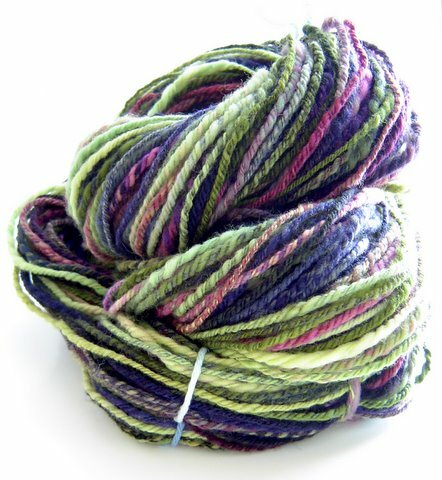 Plus, I just got my order from Simply Sock Yarn Co – FIVE skeins of Dream in Color Classy!!!! 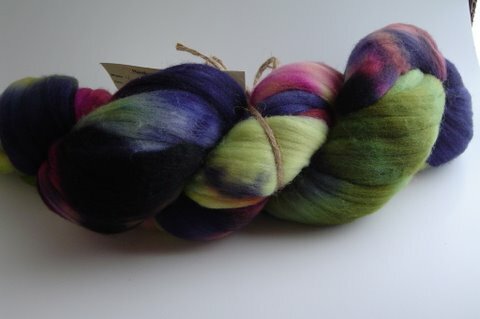 It’s in the colorway ‘Nightwatch’ for an upcoming project, which I am so anxious to cast on for, but I have to finish spinning for my HHHH pal first. 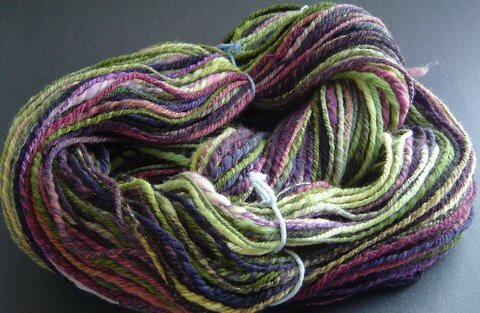 I joined the Hush Hush Handspun Hootenanny swap. We got our pals on July 7th. This is my second swap (I did sockapalooza 4 last year) and I’m very excited about this one! 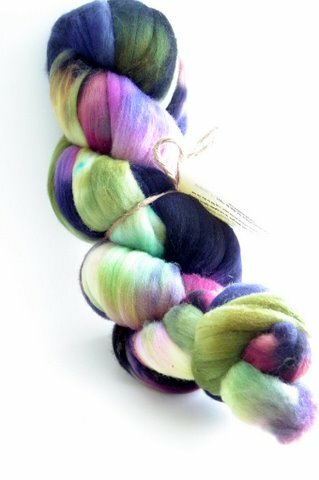 I’ve heard from the person who is spinning for me, which makes me very happy. 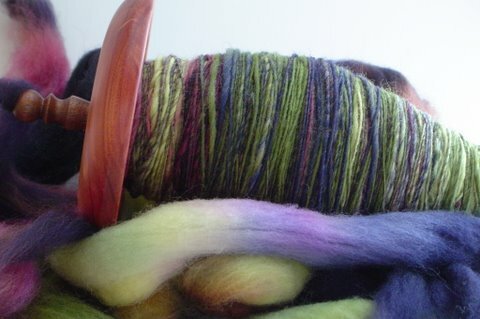 Three weeks ago, I bought fiber to spin for my pal, which has several colors my pal likes and two weeks ago, it finally arrived!! 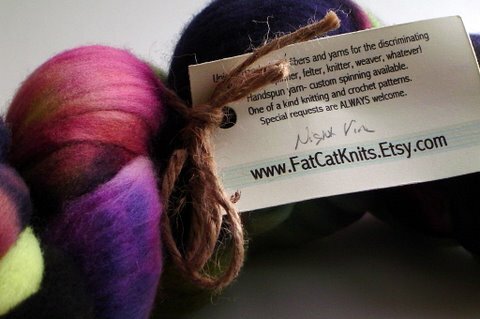 It’s called ‘Night Vine’ from FatCatKnits. I’ve started spinning it and am about half way through! 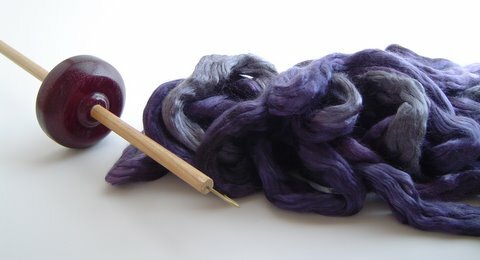 I would have never chosen these colors for myself, but I truly am enjoying spinning this fiber. Still don’t know whether or chain-ply or 2-ply. Hopefully the fiber will let me know what it wants to be. And on a completely different topic … I added a wish list to my blog (link is in the header). It’s a small list right now, but I’m sure it’ll grow.